When my son was just a little tyke, I went crazy with the Halloween decorations. I think I put the pressure on all the neighbors. Let’s just say, our whole driveway and porch were so bright at night, that not a corner was dark. I can take this holiday decorating to extreme limits. Let’s get started and here is what you’ll need for this project. Here’s what you’ll need for the project. Wilton’s food coloring that you can find at Amazon: Wilton’s Black Food Coloring. Cut the wick to about 1/2 inch in length. Next, cut a square piece of plastic (I used a top from a plastic food container…like from a salsa container). Punch a small hole in the middle of the plastic and string the wick through. Place the water in the glass container along with some veggie cooking oil (this makes the wick float and burn). Float the wick on top and then light. This a fun project and the variations are endless. This photo gives you a view of the cooking oil. Thanks for visiting! Glad you are inspired. 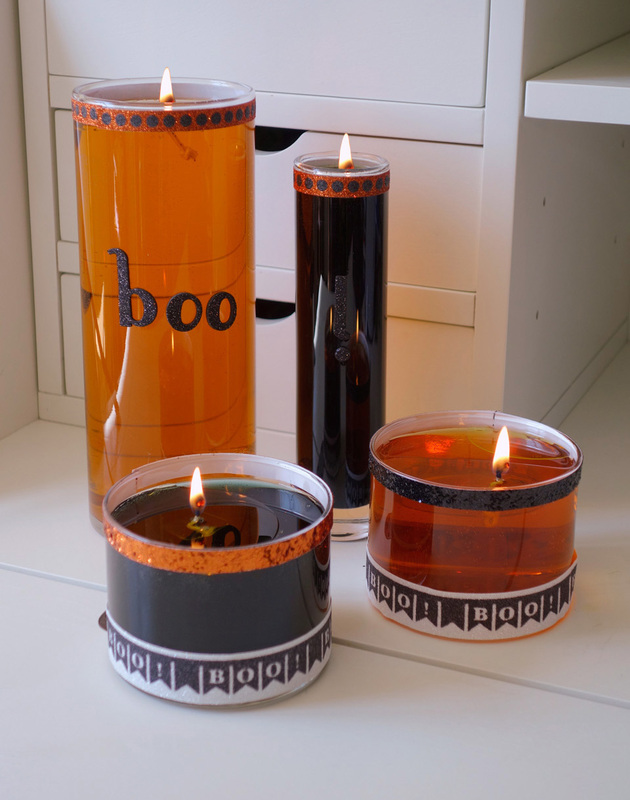 I love this project, so easy and it's a unique way to make a candle!